BEIRUT • In breaking a Syrian government siege on opposition-held areas of Aleppo, insurgents have set back President Bashar al-Assad's hopes of using Russian air power to reclaim a vital city and speed the end of the five-year conflict. The sudden advance by fighters from western Syria into a military complex in south-west Aleppo last Saturday opened a corridor into the city, breaking the weeks-long siege and providing a launch pad for fresh attacks into government-held territory. Whether they can hold, or even consolidate, their gains in a war marked by fluctuating fortunes is unclear, but the insurgents' success showed they are capable of checking the momentum that Russia's air campaign has given Mr Assad in recent months. Syria's largest city before the war, Aleppo is also important for its location near Turkey, a powerful supporter of anti-Assad groups operating in the city. In addition, its rebel-held areas are the main stronghold of most opposition groups apart from fighters of the Islamic State in Iraq and Syria (ISIS). The defeat of the Aleppo insurgents could have been seen in Damascus and Moscow as a precursor to the collapse of the armed rebellion against Mr Assad's rule. The United Nations said on Tuesday that two million people in Aleppo lack access to running water because of the escalated fighting. In the fight for the city, the disparate groups fighting the Syrian government army had demonstrated a rare unity, while also dealing a blow to Mr Assad, Moscow and their Iran-backed allies who have invested heavily in a victory. "It's clear that Aleppo will be the toughest and most important battle and most dangerous battle and the longest of all the battles that have erupted," said former Lebanese general Amine Hotait, a supporter of Mr Assad, in an article in the Syrian daily Al-Thawra. Government media has declared the fighting "the mother of all battles", while Mr Assad's ally in the war, the Lebanese Hizbollah movement, has called it "an existential struggle". For their part, the rebels speak of an "epic battle to liberate Aleppo", rallying support by citing the plight of trapped civilians in the city being pummelled by air strikes which have regularly hit hospitals and market places. 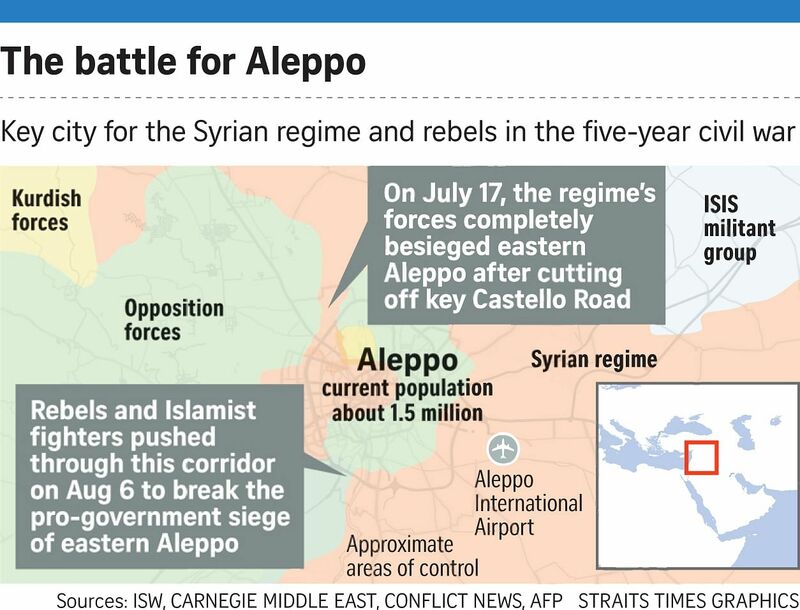 By far the rebels' biggest coordinated assault since the conflict began in 2011, the Aleppo campaign suggests they have strengthened their capabilities despite suffering heavy losses since Russia began striking against them almost a year ago. An estimated 6,000 to 8,000 rebel fighters from different groups, using dozens of tanks, broke the Syrian army's fortress-like defences in Ramousah in south-west Aleppo in only a few days. Suicide bombers led the advance. The groups ranged from the Islamist alliance Jaish al-Fateh, which includes Jabhat Fateh al-Sham, known as the Nusra Front until it cut ties with Al-Qaeda two weeks ago, to the Free Syrian Army (FSA), vetted and backed by the West. Last week's success will raise the standing of the rebranded Nusra Front, whose change of name was made partly to narrow differences with mainstream rebels. The rebel groups' unity this time, however, seemed mostly to be born of unease at the gradual advances made by government forces since Russia's entry into the war. "We were divided and distanced. Today we are one and the goal is the regime. There are no longer problems between us. We have one enemy who can destroy us, and so we have become one hand against it," said Mr Alaa al Saqar, a senior military commander in Fatah Halab, the main umbrella group for FSA groups that are present in Aleppo. The rebels' gain represents a setback for Moscow, a senior Western diplomat said, which saw victory in Aleppo as vindicating its intervention. "After these battle gains, we defeated the military option the Russian invaders and their Iranian allies and Hizbollah wanted to impose," said Mr Mohammad al-Shami, a commander from the powerful Ahrar al-Sham group, a member of the Jaish al-Fateh Islamist alliance.